Montefrio is a municipality of Granada, declared a National Historic-Artistic compound and bordering the provinces of Cordoba and Jaen, it is one of the wonders of Granada that are worth visiting. Montefrio has been occupied by early civilizations living in the peninsula; there have been found caves and primitive villages of hunters with remains as arrowheads and shaped knives showing the age of the place, being the oldest village from the year 4500 BC. 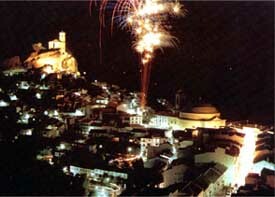 The Romans had a settlement known as 'Village of Castillejos' connecting with the coast of Malaga; it was them who built the main populations. The Arab conquest came in the early eighth century and lasted 8 centuries; they called the place 'Montefrid' from which comes the present name; they built a fortress which was key in the defence against the Kingdom of Castile since they managed to repel numerous raids until finally it was conquered in 1483 after being besieged by the Christian armies. After the conquest the population was forced to convert to Christianity so many had fled around the Alhambra or hid in other municipalities. From this period remains the church built at the Castle; the works ended in 1507. 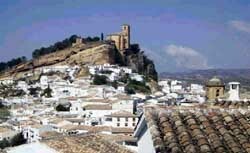 This town located at the foot of Sierra de Parapanda has been declared a place of historical interest, being the Moorish castle and the church two elements that dominate the landscape and which draw attention upon arrival in Montefrío. A walk through the steep streets of Montefrio will transport you in time; you can enjoy the rich cuisine of the municipality with typical local dishes. If you want to get in touch with nature, the Peña de los Gitanos is a place of great natural beauty, accessible by the road connecting Montefrio with Illora; a place from which to enjoy spectacular scenery with lush vegetation and ideal for hiking, you can even see hundreds of Neolithic dolmens that are dotted around the landscape. The road route to reach Montefrio is the same as that from Malaga to Loja, municipality through which you pass on the way until getting to Huetor Tajar from where you take the road Granada GR 4402 to Montefrio.